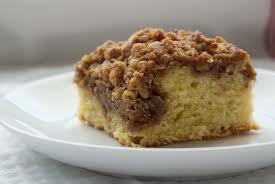 My goal this week is to find recipes for crumb cake that will jump start my using up chometz. 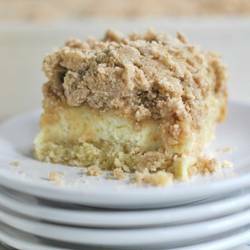 While a crumb cake (cake topped with a mixture of sugar and butter and flour and possibility nuts AKA streusel) is typically considered a coffee cake not all coffee cakes are crumb cakes. Crumb cakes differ from coffee cakes because a crumb cake is mostly crumb. Sure, coffee cakes will have some on top or swirled throughout, but the majority of the deliciousness is cake, not crumbs. The batter of a crumb cake can sometimes be a bit problematic, as it’s thick and may be a bit difficult to spread in the pan. In fact, in some fact in some recipes the batter only barely covers the bottom of the cake pan. In my opinion crumb cakes are best served while still slightly warm, they can also be cooled completely and stored, wrapped, for 3 or 4 days or frozen for a few weeks. The following recipes are truly perfect at any time of the day but for the biggest “wow” factor, put the cake together the night before and get up just a little early, bake it and serve it for breakfast. Preheat oven to 325. Grease and flour a 9×13 baking pan and set it aside. In a bowl, whisk together 1 1/2 cups flour, the white and 1/2 cup brown sugar, baking powder, and salt. In a large bowl, whisk together the egg, milk, oil, and vanilla. Mix the dry ingredients into the wet ingredients and mix to combine. Spread the very thick batter into the prepared pan (you might want/need to spray a little nonstick spray onto your spatula to help with the spreading). For the cake: Preheat oven to 350. Grease a 13×9 pan. In a bowl, combine the softened butter, flour, sugar, salt and baking powder. Mix gently to form crumbs. Take out 3/4 cup of the crumbs and set them aside. Add the eggs and milk to the remaining crumbs and mix to combine. Spread half the batter into the prepared cake pan. Spread the cream cheese mixture on top of the batter but not to the edges. Very gently spread the remaining batter on top of the cream cheese mixture. Sprinkle the remaining crumbs on top of the batter. Bake for 40-45 minutes. Cool completely before serving. Serves 12. ← GRAB THIS RECIPE/ASPARAGUS IS UNDER $2 A POUND!